So, remember in my last post, I was able to adapt i am a food blog's recipe for Earl Grey madeleines by panicking and changing the oven temperature halfway through baking time? Well, I spent the last week playing around with the recipe's temperature to see if I could get a more accurate high-altitude adjustment. I started out by increasing the recipe's bake temperature from 350 (F) up to 375 (F). BIG MISTAKE. The batter started bubbling furiously, dripping out of the madeleine pan and onto the oven floor, causing giant columns of smoke to build up in the oven. Yikes. The madeleines themselves weren't that great. There was something off about their texture -- they had a soggy crumb and shockingly greasy. My boyfriend even asked me if I had fried the madeleines in butter -- in a way I had, considering how much the batter bubbled in the oven. Unfortunately, none of my usual sources had any high-altitude adjustment recommendations for madeleines, so I turned to Foodgawker. I saw some interesting tricks -- like sticking your greased madeleine tray in the freezer to help prevent the butter in the batter from bubbling ferociously -- but the most appropriate I saw came from a blog called Nourished Kitchen. 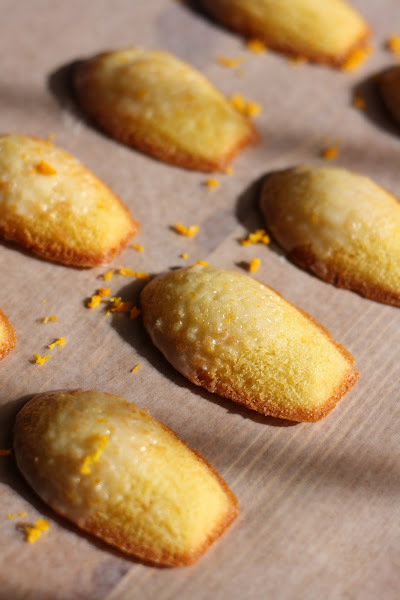 Although the recipe was for gluten-free madeleines, the author used a bake temperature of 365 (F) and warned other bakers to decrease the temperature since she lived at an elevation of 10,000 ft.
Hm. Although Denver's elevation is half of that, I wondered if it was worth a shot. Perhaps 375 (F) was too dramatic of an increase -- maybe 365 (F) was just right. Melt 6 tablespoons of butter in a small pot over medium heat, making sure to stir constantly to avoid burning the butter. When the butter is fully melted, add 1/2 teaspoon of orange zest and stir once or twice into the melted butter. Cool to room temperature. Put the egg in the bowl of a freestanding electric mixer with a whisk attachment (or, use a handheld whisk. Whip on high speed until thick, approximately 3 minutes. The egg should double or triple in volume during this time. Continuing to mix on high speed, slowly add the sugar in a steady stream. Continue mixing for 2 minutes, or until the mixture is thick. Do not rush through this step -- it is important! After the mixture is thick, turn off the mixer and use a spatula to gently mix in 1/4 teaspoon of vanilla extract. Sprinkle 3 tablespoons of flour on top of the egg batter, and gently fold in. Stir only enough to integrate the flour, and no more. Once the flour has been integrated into the egg batter, gently fold in the butter-orange zest mixture. Again, stir only enough to bring everything together and no more. Cover the mixing bowl with saran wrap, and refrigerate for at least 30 minutes or more. Once your batter has been chilled for at least 30 minutes, preheat your oven to 365 (F) -- this is an increase from the original sea-level temperature of 350 (F). You will need to lower the oven temperature at sea-level. Generously grease your madeleine pan. I used coconut spray oil, but butter is a perfectly viable alternative. Spoon the batter into the madeleine flutes, filling each 2/3-3/4 full. I filled each madeleine flute with a scant 1 tablespoon of batter, using a cookie scoop. DO NOT OVERFILL THE MADELEINE FLUTES, or butter will leach out of the pan and onto the oven floor, causing lots of scary smoke. I promise. 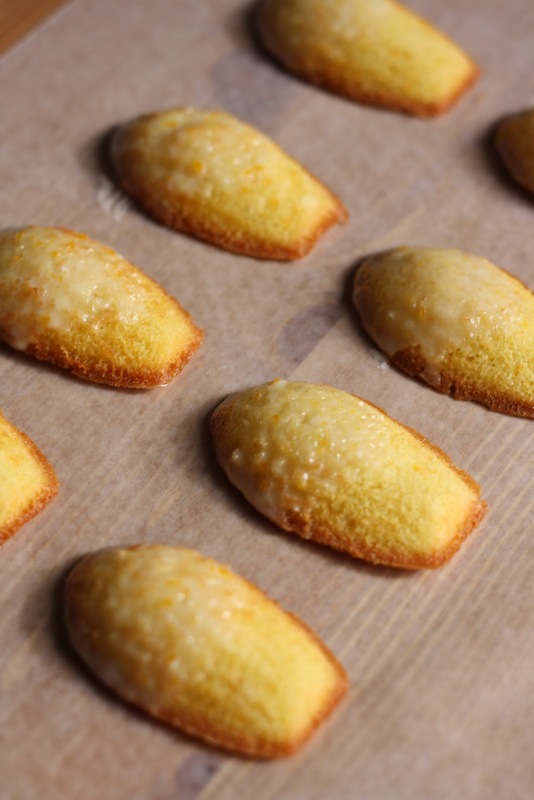 Bake the madeleines for 12-14 minutes, or until the edges of the madeleines are golden brown. Remove from the oven and let rest for a minute or two before unmolding. In a medium bowl, combine powdered sugar, milk, and honey and stir gently with a rubber spatula until the mixture becomes an opaque syrupy texture. Sprinkle in orange zest, and stir until just combined. Gently dip the fully cooled madeleines in the resulting glaze, and lay on wax paper to dry for a few minutes. You can substitute orange zest with any ingredient you prefer; for instance, the original recipe used Earl Grey tea leaves. I have also made this recipe with lemon zest and lavender flowers. When creaming the eggs and sugar together, always make sure you keep creaming until the mixture is light and fluffy. This will usually take around 5 minutes on med-high speed on your mixer. 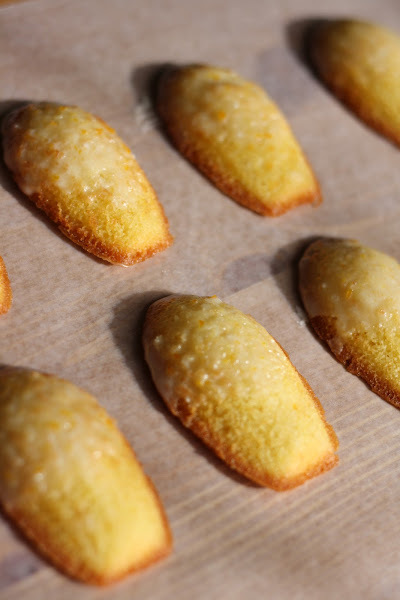 During the creaming process, sugar crystals open tiny pockets of air in the egg as it is being whipped, giving the madeleines their light and fluffy texture. 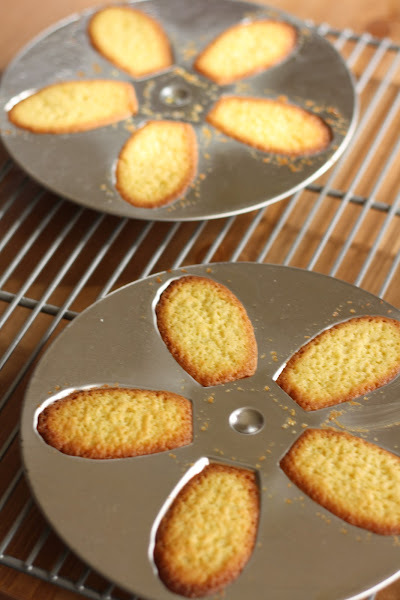 Do not overfill your madeleine tin with batter -- doing so will cause butter from the batter to leach out of the tin and into the oven floor, causing alarming amounts of smoke. 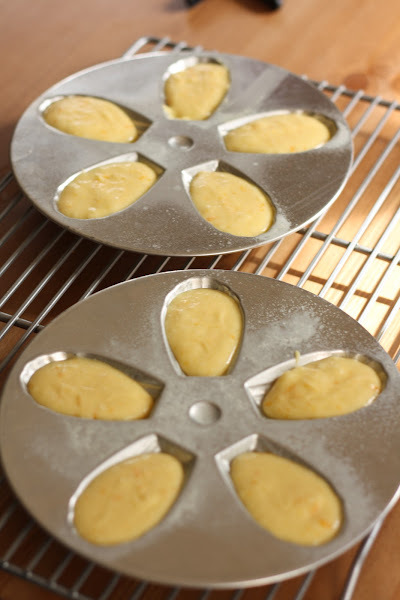 If you find that your madeleine batter is bubbling a little too violently during the baking process (some bubbling is normal -- just not too much), you can reduce this by sticking the pre-buttered madeleine baking pan into the freezer as the batter is being chilled. However, doing so will increase the baking time and will result in slightly less crispy madeleines. If you prefer a thicker glaze, feel free to add more powdered sugar to recipe quantity. Hi, Michelle. I was looking at this recipe and then went back to i am a food blog Earl Grey Madeleine recipe via the link. 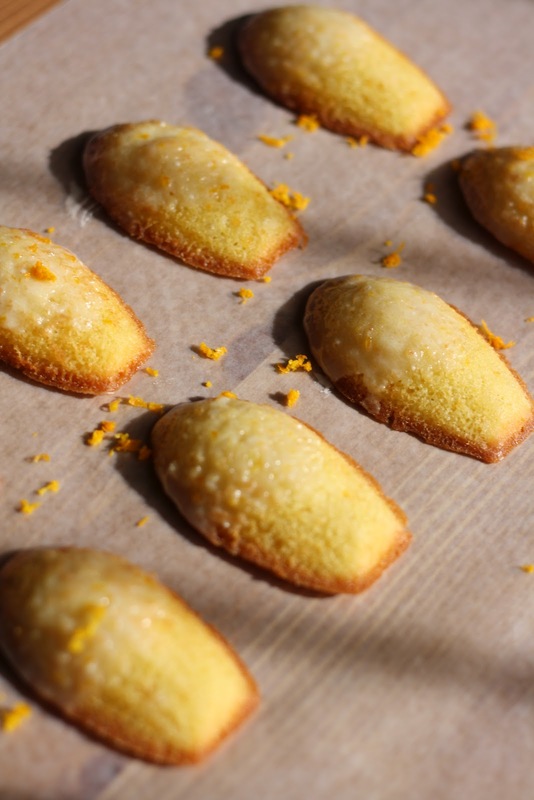 Since this post, I am food blog made a correction in the butter amount after a reader commented that the madeleines "came out drowning in butter". Just thought you'd like to know.